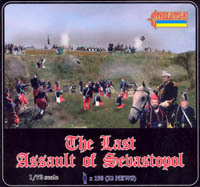 The last assault on Sevastopol to which the title alludes was the attack on the Malakov and surrounding strongpoints on the 8th September, 1855, by French and British troops. The fighting was particularly bloody and many of the assaults failed, but the French captured and held the vital Malakov Tower, and with its loss the Russians realised they could no longer hold the southern part of the town and evacuated. With that the war began to peter out, although there was still much fighting and dying to be done before peace was officially signed six months later. As with all Strelets big sets this one contains a number of older sets along with some new material. To begin with then we will detail what contents have been seen before. 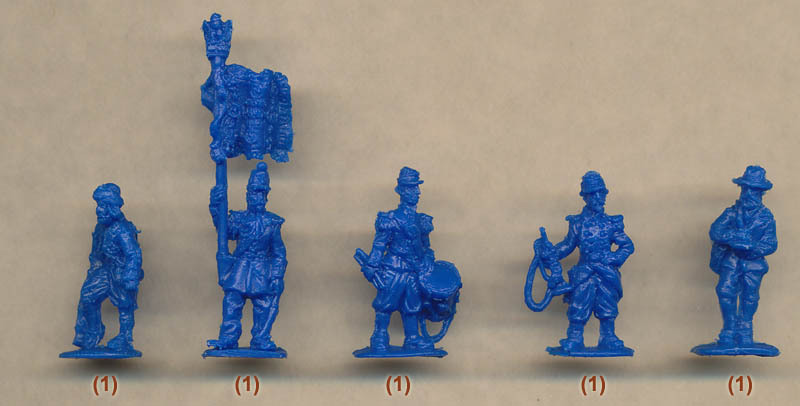 It contains full copies of Strelets Cossack Infantry and Sailors, French Light Infantry and French Zouaves, plus two sprues from their French Line Infantry sets. All of these have been reviewed before so have not been included in our photographs above, and reference should be made to the earlier reviews for pictures and comments on these figures. What is new is two sprues containing a total of 32 figures as pictured. These are an assortment of French generals, officers, staff and some of the more specialist figures that do not justify inclusion in the Strelets 'mini' format. All but the last row could be described as officers and staff of various descriptions. For all sorts of reasons officers did not always follow the strict regulations for wear of their unit, but every uniform here is either correct or perfectly plausible. We can't identify any particular individuals (although doubtless some will have chosen some for themselves), but the first figure in the fourth row looks to be taken from a famous photograph of General Bosquet, and indeed several figures seem inspired by such photographs, which is a very reasonable source to use. Some of the figures are apparently in battle, while others look to be at rest, and just about all elements of the French army seem to be represented. So everything seems to have been covered here, providing a pretty comprehensive set of officers for Napoleon III's army. Our bottom row shows some of the ordinary troops. The first is a wounded zouave, while the flagbearer (with a rather small flag), drummer and trumpeter speak for themselves. The last man is in civilian dress and could serve for many things but we like to think of him as a newspaper correspondent. The style and quality of the production of these new figures closely matches that of the older sets they accompany, which is not of the best but is at least consistent, and there is no flash nor excess plastic here. It is true that some of the poses are somewhat awkward and particularly flat (such as the men holding their sword directly over their head), but the relaxed nature of many of them makes them an easy subject for the sculptor and therefore look fine. Taken as a whole this big set is hardly representative of the entire French Army, with more officers and far more zouaves than ordinary line infantry, but it does offer a good starting point for a collection of French infantry, and provides a lot of the sort of men that rarely get made - particularly staff and casualties - so is much more worthwhile than the very shoddy Photoshopped box artwork seems to promise.